and Jasmine Bubbles are names of the candles in the 50 Shades set from Old Factory. I love Old Factory and you should head over to amazon to get some immediately. They are hand poured in the USA, made of natural soy wax, and have self trimming cotton wicks. They use premium fragrance oils, and burn even for 20 hours. Each gift set is themed around a group of related fragrances. Be picky about your candles, like your men, and enjoy…..
of music and fragrance are combined by Gwendolyn-Marey. This company’s perfumes and candles are accompanied by a musical suggestion, allowing an environment to “take you away”. I was sent their premier line “Pavane”. it is based on the “dignified couple’s dance popular in Europe during the 16th century Renaissance”. 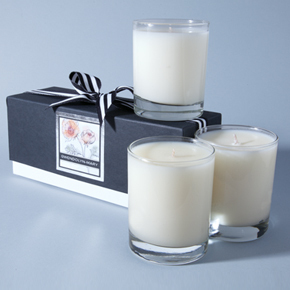 The hand poured soy candles are made from the finest oils, derived from raw materials from around the world. The perfumes are light and mix well, or work delightfully on their own. My favorite is Pavane No 1.This is made of sweet lychee fruit, fig, orange blossom and fresh-cut grass. So dazzle your body and your home with Gwendolyn-Mary scents, and make music…. The best gift to give, is the one that you get back 😉 So this Valentine’s Day consider Earthly Body Massage Candles. They melt down in to a silky massage oil that is more like an amazing moisturizer versus a heavy goop. They have cute names like, “naked in the woods” and “Dreamsicle” , so they’re sure to send the right message. They are environmentally friendly, made with vitamin E, Hemp, and petroleum free. I got mine at Ricky’s NYC. So light one up and strip on down…..